89% (611 ratings) Master of sciences, B.V.Sc. & A.H.
Dr. Amarnath Muthukrishnan Tvc : 3771 is one of the best Veterinarians in Fairlands, Salem. He has been a successful Veterinarian for the last 19 years. He has done Master of sciences, B.V.Sc. & A.H. . You can meet Dr. Amarnath Muthukrishnan Tvc : 3771 personally at Amulya Pet Specialty Clinic in Fairlands, Salem. He has earned excellent reviews by 12 patients. Don’t wait in a queue, book an instant appointment online with Dr. Amarnath Muthukrishnan Tvc : 3771 on Lybrate.com. Lybrate.com has a nexus of the most experienced Veterinarians in India. You will find Veterinarians with more than 30 years of experience on Lybrate.com. You can find Veterinarians online in Salem and from across India. View the profile of medical specialists and their reviews from other patients to make an informed decision. He is completely amazing and very helpful doctor. Words would fall short to describe my experience with Dr.Amarnath. Just with the history he got the diagnosis and our pet showed immense improvement with his treatment. He is quick to help and respond to our queries. He is also a very good human being and take care of his patients extremely. I would recommend him to all the people who are having problems with their pet as this doctor knows his job too well. God bless Dr. Amarnath. The best veterinary doctor I ever came across. thank you doctor.but i have given a food supplement containing omega 6 or omega 3 and the tonic was called "nutricoat".His hair quality had improved but he still had a lot of shedding of hair due to dandruff.and I brush his hair regularly but there are no infections.he only has dandruff.His meal is like that rice and pressure cooked meat soup at 10 am,2 biscuits at 6pm and 5 rotis with the meat soup at 7 pm.Is not that good enough?The meat used is chicken.please help. The veterinary treatment given by Dr Amarnath was great. My pet is perfectly fine now. I was very worried about my pet's condition but now I am glad that I chose to consult him. He ensures that he gives enough time. He is not just highly qualified, but has years of experience in handling high risk cases. My previous experiences were not so good, but Dr Muthukrishnan has completely changed my opinion as he is very helpful and humble. i go to him for my dogs pet grooming. I read about him on one of the social media platform. All the staff members were very helpful. The veterinary surgery given by Dr Amarnath was great. My pet is perfectly fine now. The staff was very attentive to all needs. He ensures that he gives enough time. He is not just highly qualified, but has years of experience in handling high risk cases. My 4 year old labrador started having fits one day. We rushed him to dr Amarnath Muthukrishnan at Amulya Pet Specialty Clinic in Salem. he is an excellent doctor, humble ..very fair in his practices .one can really trust him blindly with their pets. I took my pet for veterinary services to Dr Amarnath. The entire Amulya Pet Specialty Clinic was spotlessly, clean. He is very courteous and behaves very aptly. The Amulya Pet Specialty Clinic have proper facilities . My pet dog was injured very badly. 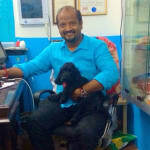 i took him to Dr Amarnath, he is a veterinary specialist. He treated my dog very nicely and did a small surgery. Now its been more than 3 months and my dog is perfectly fine. Dr Amarnath has broad knowledge in Veterinary. He is really a great doctor and has sympathy towards animals. The traetment for birds he gave was great. Any vet doctor available for my 5 years dog for online consultation please reply to this question. I am trying from past 3-4 days but no doc is willing to answer and payment gets refunded every time. Thank you. Most of the doc were in singapore for world conference may be thats the reason please go through payment channel again they will now. There are many reasons Dog/Cat may have a disturbed stomach, however there's one normal cause: he ate something he shouldn't have. Vomiting and diarrhea are signs that a dog’s body is trying to expel something that shouldn’t be in their system. In a healthy dog, it’s a protective mechanism of the body that’s totally normal. Stress may also trigger an upset stomach, as can bacteria imbalances in the gut and food sensitivities, which are most likely caused by dog’s diet. Diarrhea and vomit are the most obvious signs that dog’s stomach isn’t feeling right, but you should also keep an eye out for fatigueand loss lost of appetite. Your dog may gulp a lot to combat reflex, lick his lips, or even lick the air or objects, too. If he’s nauseous, you may also see him eat grass in order to soothe his stomach or try to induce vomiting. An upset stomach once in a while is normal in dog, but when a dog suffers often, it could signal that something is wrong in his gastrointestinal tract.In that case look at your dog’s diet and staying away from foods that may create inflammation because of a food hypersensitivity, like chicken, lamb and venison. Instead, choose meats like beef, buffalo, and fish that shouldn’t irritate your dog’s GI tract. To maintain a healthy dog gut, you can also consider giving him a pre and probiotic. When dog’s stomach is trying to get rid of something, it can be helpful to stop putting more things in his stomach for 12 to 24 hours. Fasting for that long is absolutely fine for the dog. When dog is vomiting or has diarrhea, you want to make sure he stays hydrated, however, giving him too much water may make his stomach even more upset. Remove his water bowl from his reach, and give him ice chips every 2 to 3 hours, if he can keep that down, then give him some more ice cubes and a couple teaspoons of water. One of the most powerful things you can give to dog to soothe and healhis stomach while keeping him hydrated is bone broth. Once the meat falls off the bone, continue to simmer the bones until the minerals and marrow are released into the water. Bone broth takes at least a day to make, so you’ll need to make this meal before your pet actually gets sick. If you make it ahead, however, you can skim off the fat and freeze it, then you can give your dog bone broth ice cubes when he’s sick. When fighting indigestion, canned pumpkin is a vital. It has a low glycemic index, so it slowly absorbs, which helps with upset stomach and digestion. Make sure to get canned pumpkin, and not pumpkin pie mix, as you don’t want to feed dog spices. Smaller dogs (approximately five pounds) can be fed ½ teaspoon of canned pumpkin, while larger dogs (approximately 75 pounds) can be fed 1 tablespoon. Add a tiny bit of ginger to the canned pumpkin. My pet pug of 1.5 yrs. Was getting steaks and fleas in his body. How can I get rid of this. Can you provide some medication so that fleas and ticks will full free from that. Need to find out the kind of flea and its extent in your pet. So check with a vet general remedies would be applying neem oil for time being. But its stinks and also sticky .its your call to decide. Hi. My pug is 5 months. Shedding a lot. And please let me know what should I make him eat as he is very fuzzy and just likes eating boiled chicken 2 times a day. Is it safe for him to have daily chicken. Or what else I should try feeding him. Please suggest. Yes safe to feed your dog with boiled chicken as by birth they care carnivores and for hair shedding please give him omega fatty acids to control shedding or fish oil. Stress may also trigger an upset stomach, as can bacteria imbalances in the gut and food sensitivities, which are most likely caused by dog’s diet. Diarrhea and vomit are the most obvious signs that dog’s stomach isn’t feeling right, but you should also keep an eye out for fatigue and loss lost of appetite. Your dog may gulp a lot to combat reflex, lick his lips, or even lick the air or objects, too. If he’s nauseous, you may also see him eat grass in order to soothe his stomach or try to induce vomiting. One of the most powerful things you can give to dog to soothe and healhis stomach while keeping him hydrated is bone broth. Simmer meat (on the bone) with apple cider vinegar and water in a crockpot (Backus prefers using a whole organic chicken). Once the meat falls off the bone, continue to simmer the bones until the minerals and marrow are released into the water. Bone broth takes at least a day to make, so you’ll need to make this meal before your pet actually gets sick. If you make it ahead, however, you can skim off the fat and freeze it, then you can give your dog bone broth ice cubes when he’s sick. Sir, We have a rescued Pointerdor female dog. She is a lovely dog but very very nervous the moment she steps out of the house. Please help. Nothing to worry, if her feeding habits and other things are normal, play lot like a kid for few weeks.